Elite Screens will be showing its latest lines of ALR/CLR® (ambient and ceiling light rejecting) projection screens at the 2019 Consumer Electronics Show. CES is the world premier technology venue. It showcases the latest in technological innovation like Elite’s new CLR®2 material. This new ALR/CLR® material is made for use with either Short-Throw (ST) or Ultra-Short-Throw (UST) projectors. High quality projectors are more affordable to CE Retail shoppers than ever before. This requires a projection screen that will reject the washout effects of ambient light under normal room lighting conditions. It also means that all this screen performance must be available at a fraction of the cost of said projector. Elite’s new CLR®2 material is ideal for Residential and Commercial applications. It will be available in a variety of fixed-frame, motorized electric, and portable formats. We look forward to seeing you at the Venetian Suite 30-120. The Evanesce Tab-Tension B Cinegrey 5D® is an electric projection screen designed for integrated “in-ceiling” installations. It utilizes Elite’s Cinegrey 5D® ambient light rejecting material for superb performance with the lights on or off. The tab-tensioned material provides uniform flatness over the entire projection surface with superb color saturation, contrast and black/white dynamic range. IR/RF remote control package with 5-12 volt trigger included. 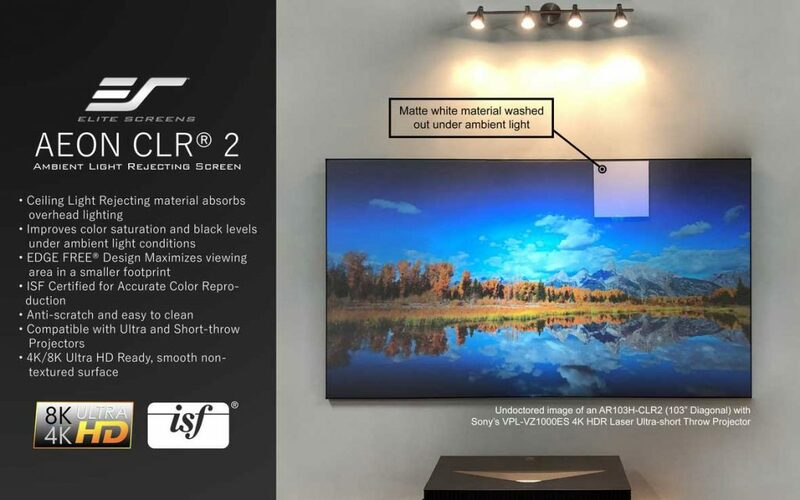 Elite’s CLR®2 is a durable ALR/CLR® material designed to maintain superb image brightness, color fidelity, contrast, and dynamic range under normal room lighting conditions. It is ISF certified for accurate color reproduction and protected by a scratch-resistant protective layer for heavy use. Available in Many Formats: The CLR®2 material will be available in Fixed-Frame, Motorized Electric, and Free-Standing Portable designs. Commercial Applications: Overhead lighting is the primary source of ambient light in workplace applications. In addition to rejecting off-axis light from windows and tabletop light sources, this material’s Ceiling Light Rejecting® (CLR®) qualities make it ideal for large and small business applications. Residential Applications: Most homes have gravitated away from the completely dark “dedicated” home theater room. To compensate for the effects of normal interior lighting levels, a specialty material is required. The CLR®2 material makes it ideal for “larger-than-life” TV presentations.